Pre-Workout supplements can be a great way to increase the intensity and duration of your workouts. Here we will go over what you should look for when buying a pre-workout supplement and offer a few good choices. Regular workouts are great for the body and mind but let’s be honest, some days it’s harder to get motivated than others. Whether you’ve been working out for years or you just started a few weeks ago, it’s important to get the most out of your workout. Sustaining energy, endurance, and motivation are essential to a successful workout session, and the right pre workout supplement can help you achieve that success. We’ve reviewed and chosen five of the best pre workout supplements for women that we enjoy. Even if you exercise on a regular basis, you may not know what a pre workout supplement is or have even considered using one. If you’re like millions of other women who find time to work out, despite a busy schedule, you might have a hard enough time remembering to bring your water bottle let alone a supplement before you head to the gym. In short, a pre workout supplement is designed to give you help you focus, have better endurance and energy during a workout session. While pre workout supplements come in the form of a powder or pill, for this review, we will only be discussing and reviewing pre workout powders specifically created for women. Pre workout supplements may vary from one to the next but often contain common ingredients such as caffeine, creatine, amino acids, vitamin complexes, protein, carbohydrates, and electrolytes. Who Benefits From Using a Pre Workout Supplement? For years, pre (and post) workout supplements were usually targeted towards bodybuilders or male athletes who did intensive training. Today, there are numerous brands and types of pre workout supplements on the market, and they aren’t just for athletic men anymore. Traditionally, men are more likely to lift weights and women may try out a variety of workouts such as yoga, pilates, or even kickboxing. Today, men and women are participating in the same types of exercise, which means that many women may benefit from a pre workout supplement. If you walk daily and do gentle yoga a few times a week, would a pre workout supplement be necessary or even beneficial? Maybe not, but if you run and do strength training, you might find that a supplement could help you go that extra mile or lift a little bit more than usual. It’s common to reach a plateau in fitness goals or even struggle to find motivation. If you find yourself facing these challenges week after week, it may not hurt to try out a pre workout supplement. Remember, you don’t need to be a bulky weight lifter to benefit a supplement. If you walk into any gym, nutrition store, or most big box stores, looking for the right pre workout supplement, you might get a little overwhelmed by the results. So many containers look the same, promise to do the same, and each one is claiming to be “the best.” Pre workout supplements, if you choose the right one for you, can be a worthy investment but you it can’t always (and probably shouldn’t) judge by the price tag alone. Choosing the best pre workout supplement for women requires knowing what you want from a supplement, reading the label, and understanding how some of the ingredients benefit you. As with every health and fitness product, it’s a good idea to know what you’re putting into your body; pre workout supplements are no different. While we mentioned briefly that supplement ingredients might vary from one supplement to the next, we take a closer look at some of the most common ones and explain what they do for you and how they can help you before a workout. Many of us use caffeine (usually as coffee or tea) on a regular basis to give our energy a little boost throughout the day. If you’ve never considered having a little caffeine before a workout, it may be worth a try as it can be beneficial. Studies suggest that low to moderate doses of caffeine (100-200 mg or 1 to 2 cups of coffee) can improve performance and increase alertness and help maintain focus. Many pre workout supplements for women contain natural caffeine often in the form of green tea or cocoa. Most supplements contain creatine, and many people don’t much about creatine. Our bodies already have creatine, which is a chemical that is also found in red meat and seafood. While creatine is beneficial in many ways, a synthetic version is often added to workout supplements to improve exercise performance or to increase muscle mass. Protein can be beneficial before (and after) any workout as it can help the body become (and remain) leaner. Whey protein is one of the better types of protein to consume before a workout but if you don’t see “protein” on the label, look for BCAAs. Branched-chain amino acids (BCAAs) include leucine, isoleucine, and valine and these essential amino acids make up approximately one-third of muscle protein, which can be beneficial for intensive workouts. BCAAs are added to pre-workout supplements to support metabolism and also help to boost energy. Beta-alanine is another common ingredient added to many pre workout supplements for women as it helps to fight fatigue during a high-intensity workout. A delay in fatigue means that you can extend your workout session and push yourself a little harder. Some important vitamins to look for when selecting a pre workout supplement is Vitamin-B complex, and Vitamin C. Vitamin B helps to maintain your body’s metabolism and promotes energy while Vitamin C can help your body handle the stress of exercise. It can also help to prevent coughing and wheezing while you work out. Does Every Woman Need a Pre Workout Supplement? As mentioned briefly, not every woman works out the same or even engages in intense exercises. If you’re a runner, take a spinning class, or lift weights you may benefit more from a pre workout supplement than a woman who takes tai chi or water aerobics. It’s not that one cannot consider a pre workout supplement, but you should choose a product that will enhance, improve, and help you during your workout. If for example, you take yoga, you may not want (or need) the extra caffeine before your class. RED LEAF PRE-WORKOUT - Best tasting pre-workout nutrition supplement with natural cranberry lime flavors. This is a healthy energy blend great for women and men. ANTIOXIDANT AND ENERGY BLEND - Extracts from natural antioxidants like green tea support vibrant health and energy. A modest dose of pure caffeine gives men and women a healthy, jitter-free boost. BETA-ALANINE - Beta Alanine reduces muscle fatigue and helps fuel intense workouts. Amino Acids, including BCAA's, L-Glutamine, and AAKG feed your muscles to support stronger workouts and recovery. The Red Leaf Pre-Workout Energizer contains many of the common and essential ingredients we discussed: beta-alanine and BCAAs. The powder, which dissolves in water, contains a low dose of caffeine in the form of Green Tea Extract. This powder is a great option for someone who is hesitant or sensitive to caffeine, and the ingredients are natural. It can also be used throughout the day as an energy booster, and the small container (which holds 30 servings) is convenient enough to take on the go. Naked Energy is a natural pre workout supplement that includes amino acids and essential vitamins like C, B3, B6, B12, and Calcium. The caffeine content comes from unroasted coffee beans.There are no artificial sweeteners, colors, or flavors and it’s a suitable blend for vegetarians and vegans. With 50 servings (2 scoops per serving) in each container, you can enjoy the supplement by mixing it into your favorite beverage. This pre workout supplement is a good option for any woman who is looking for a “no nonsense” formula and wants something with all-natural ingredients. 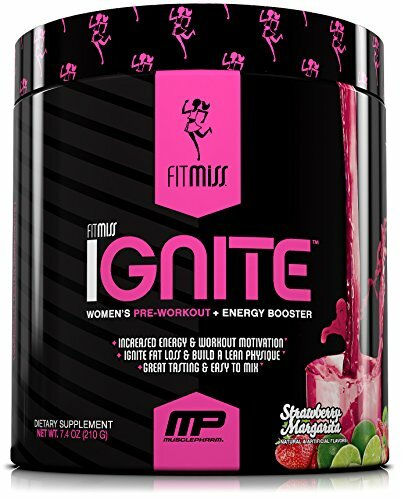 POWERFUL PRE-WORKOUT ENERGY BOOST: Formulated with high-quality and carefully selected ingredients, FitMiss Ignite is an exceptional women's pre-workout supplement and energy booster. PROMOTES HEALTHY BODY COMPOSITION: Carefully formulated specifically for women, FitMiss Ignite supports converting fat into energy, improving endurance, and promoting a healthy body composition. Much like other pre workout supplements, FitMiss Ignite Pre Workout Supplement is designed “just for women” and boosts energy during a workout. It also helps to build muscle, while maintaining a lean physique, and may also aid in weight loss. The “Proprietary Blend” includes Beta-alanine, L-Glycine, Taurine, Beet Root Extract, Hawthorn Berry Powder, and other ingredients. Available in “Strawberry Margarita” flavor, this pre workout supplement may be just the taste you’re looking for before your exercise. Working out can be a lot of fun, but it can also feel like one of the biggest hassles or obstacles in life. Pre workout supplements are designed to make workouts easier and more of the results we want to see. Not only is it important to fuel our bodies but also our minds. 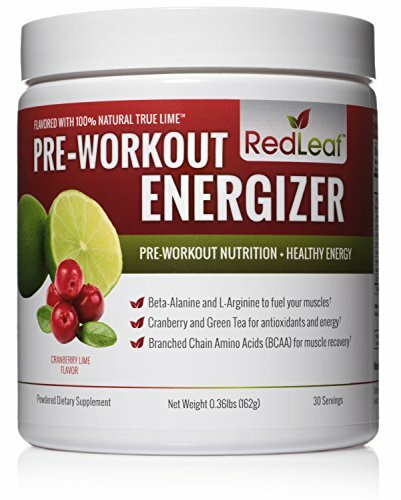 While many of the pre workout supplements had things we loved, our “best” pick was Red Leaf Pre-Workout Energizer. We loved this supplement because the taste was pleasant and was refreshing (it didn’t have a bad aftertaste like some other supplements). It contains some essential ingredients like Beta-alanine and BCAAs, and it provided enough energy for a high-level hour long workout. There was no sense of “crashing” or feeling jittery as the caffeine dose was moderate yet effective. While this formula may not offer enough benefits to a female athlete training intensively, it is suitable for women who like to workout at the gym, weight lift, run, or take a cardio-intensive class like spin.